The first car arrives over two hours before the hulling station officially opens in Jeffersonville, Kentucky. By the time that Renee Zaharie appears and starts the hulling machine, four more vehicles have pulled in and are waiting under the darkening evening sky. 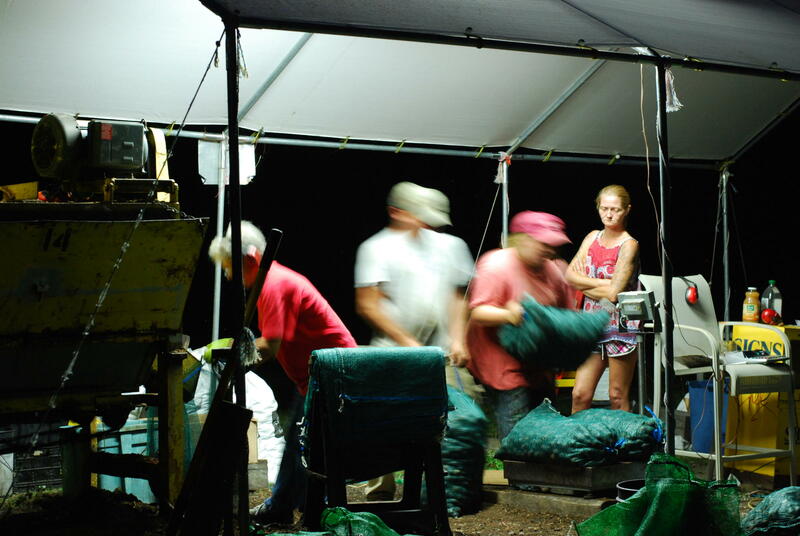 The steady murmur of conversation (and the occasional guffaw) hums beneath the tent protecting the machine from the elements, as walnut hullers shoot the breeze after a long day of picking. Occasionally, a plaintive mew announces the otherwise-silent arrival of one of the 40 cats that Renee and her husband, William, foster. Out front, cars zip by on the busy county road. All around, the soft chirps of crickets sing their nightly chorus. It's the first weekend of the annual black walnut harvest that takes place each October, and the air is festive. During black walnut season in October, the tree nuts rain down everywhere. 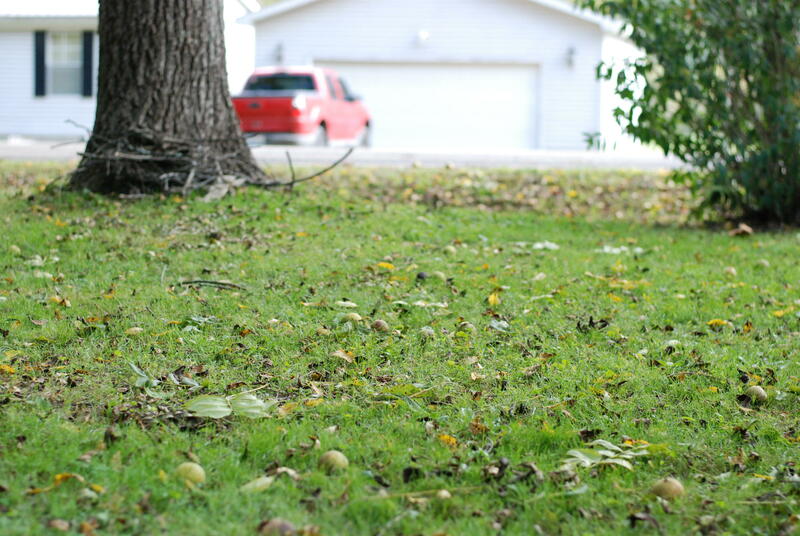 For homeowners, they present a nuisance that can damage lawn mowers. Mike Foight of South Shore, Ky. enlists his grandchildren to clear his yard (pictured here) and earn some spending money. Black walnuts are native to North America (including six Appalachia states) and, unlike many other tree nuts, grow in the wild. The green, tennis ball-sized nuts rain onto fields, roads, vehicles and sometimes, people, presenting a nuisance to cars parked beneath them and a danger to lawn mowers everywhere. While some may dread black walnuts for these reasons, for many others, the annual harvest is a welcome time of the year: a sign of the changing seasons, the return of a beloved baking ingredient, and, perhaps most importantly, an opportunity to earn extra cash. Black walnut harvesters gather the nuts locally—from their yards, nearby yards, roadsides and forests—and bring them to one of 238 hulling stations in 14 states across the country. There, hulling operators use specialized machinery to removes the hulls (which can make up to half of a black walnut’s weight), weigh the hulled walnuts, purchase them, and send them to Stockton, Missouri for shelling and further processing. 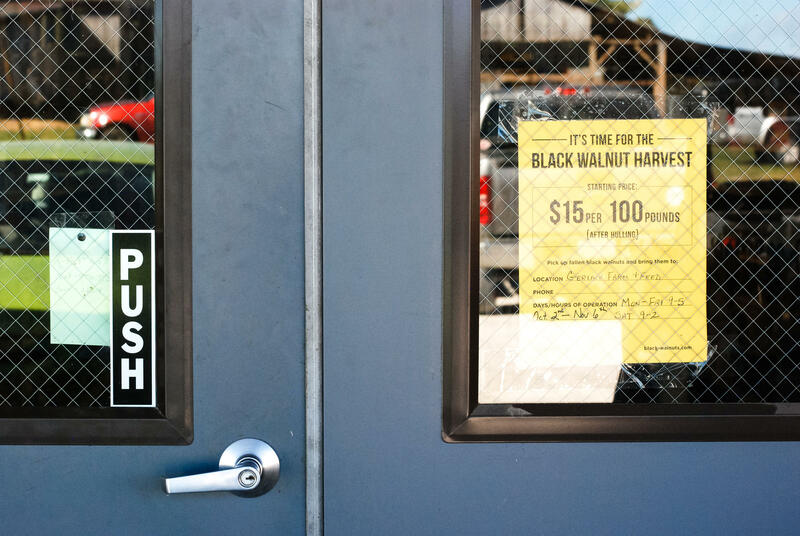 Stockton, the unofficial black walnut capital of the world, is home to Hammons Product Company (HPC), a family-owned business that has been shelling black walnuts for the past 71 years. The company sets the price for black walnuts every year. This past October, they paid $0.15 per pound to walnut pickers, and an additional $0.05 per pound to hulling stations. Brian Hammons, the company’s president, says that they produce an average of 23 million pounds annually and are expecting a bumper crop in Appalachia this year that will push that figure upwards of 30 million. After shelling the nuts, HPC sells them raw in grocery stores and specialty retailers, as well as directly to chefs and ice cream makers (black walnut ice cream is wildly popular in certain parts of the country). There’s also an ever-increasing selection of black walnut products, like black walnut oil, and even myriad uses for the shells, which can serve as eco-friendly ingredients in sand-blasting agents, water filtration systems and even sports fields. Every part of the nut is able to be used. At Gerlach Farm and Feed in Wheelersburg, Ohio, Paul Riggle receives cash for his load of black walnuts. This year, Hammons Product Company is offering $0.15 per pound, the highest price that they’ve ever paid. Black walnut harvesting is also a unique business because it’s low-risk for the hulling operator, say Christina Gerlach-Armstrong and her husband, Darryl Armstrong, who run Gerlach Farm and Feed, the only remaining family-owned feed store in Scioto County, Ohio. In October, their store also hulls black walnuts. In good years like this one, as much as 25 percent of their business activity will be dedicated to the hulling. HPC reimburses the hulling stations for their payouts to individual harvesters, pays the hulling stations a commission, and handles the nut delivery by scheduling regular semi-truck pick-ups. On years with low yields, they’ll even connect the hulling stations with other buyers, which saves them on trucking costs while giving the hullers a market and benefiting the buyer. A few years ago, Darryl and Christina recalled that Hammons connected them to West Virginia’s Department of Natural Resources, whose forestry division used the nuts as squirrel feed. That village includes a variety of motivations, as well. There are harvesters like Annabelle Richie, who returned to walnut picking after a long hiatus to make money for her husband’s Christmas present. Some simply enjoy spending time outdoors, like retiree Paul Riggle, and others want to teach the next generation the value of hard work, like Mike Foight, who takes all of his grandkids out walnut picking. Full-time walnut harvesters like Penny Hednell spend September picking pawpaws, October culling black walnuts and, in the spring, wild ramps that are also native to many parts of Appalachia. Then, there are those who simply need to clear their yards. For many of the hullers, interacting with these community members is part of the appeal. Such is the case for Chris Chmiel, the owner of Integration Acres and a county commissioner in Athens County. “I like providing this service to people,” he says, even though his main passion is not black walnuts, but Ohio’s native fruit, the pawpaw. He organizes the annual Ohio Pawpaw Festival, and found his way to the black walnut business because of the overlap between the two. In addition to both being native fruits, a lot of Chmiel’s pawpaw foragers also collect walnuts. Pawpaws, it turns out, grow well beneath walnut trees. For the Zaharies, who run the hulling station from their modest five-acre property, black walnuts are the only source of income for both themselves and the animal rescue that they run on site. The first customer of the night watches as her walnuts are weighed in Jeffersonville, Ky. This year’s price is $0.15 per pound of black walnut. The couple started out as walnut pickers themselves, but the nearest hulling station was more than an hour’s drive away. When they bought their property, they decided to begin hulling at home. In the 11 years since starting, their hulling operation has become the most productive in all of Kentucky, and many neighboring states as well. While the duo’s dependence on hulling as their income is not the norm among hullers, they are not alone in their desire to challenge the dominant economic and food systems. According to the U.S. Department of Agriculture, $7 billion worth of tree nuts are grown in the United States annually. But unlike black walnuts, most tree nuts are grown and harvested in large-scale, monocultural orchards concentrated in California. Orchards mean a much more stable supply of crops, and the improved varieties typically grown also improve nut yield and profitability. However, orchards are more resource-intensive, and their lack of genetic diversity makes them less resilient against disease. 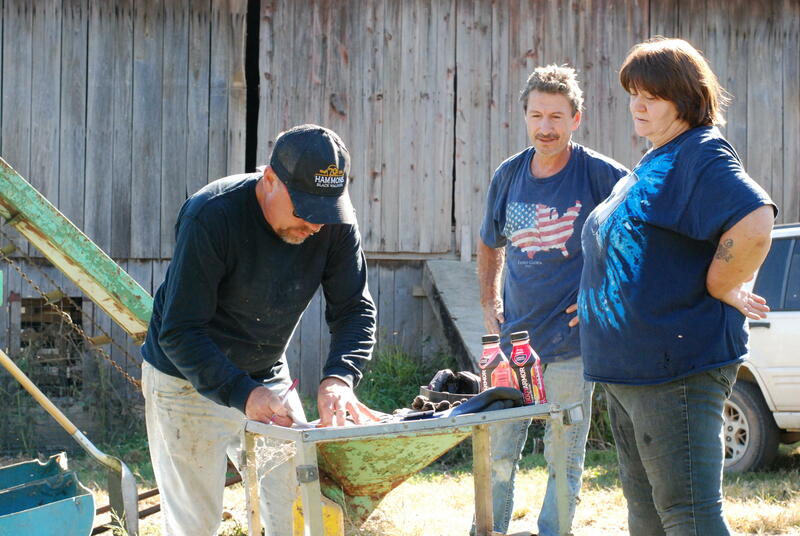 Chris Chmiel of Integration Acres writes out a check to Penny and Larry, his first two customers of the season. Penny and Larry are retired, and spend all of October picking black walnuts from around the county. Brian Hammons believes that black walnuts have the potential to become a much bigger industry—his annual net sales are in the range of $12-14 million. Black walnuts also meet many of the current demands in the food industry, which is placing greater value on native and foraged products, as well as sustainability and health. Hammons does not believe that orchard-grown black walnuts will negatively impact the wild black walnut harvest. If anything, he says, the increased market will benefit everyone. And, with the number of nuts that lie unpicked every year, he may be right. Eileen Guo is an independent print and audio journalist covering communities and subcultures on the fringe. She has reported from both urban and rural America, as well as Afghanistan, China, and Mexico. Follow her on Twitter (@eileenguo) and visit her at eileenguo.com. How Many Historic W.Va. Buildings will Benefit from Increased Tax Credit? 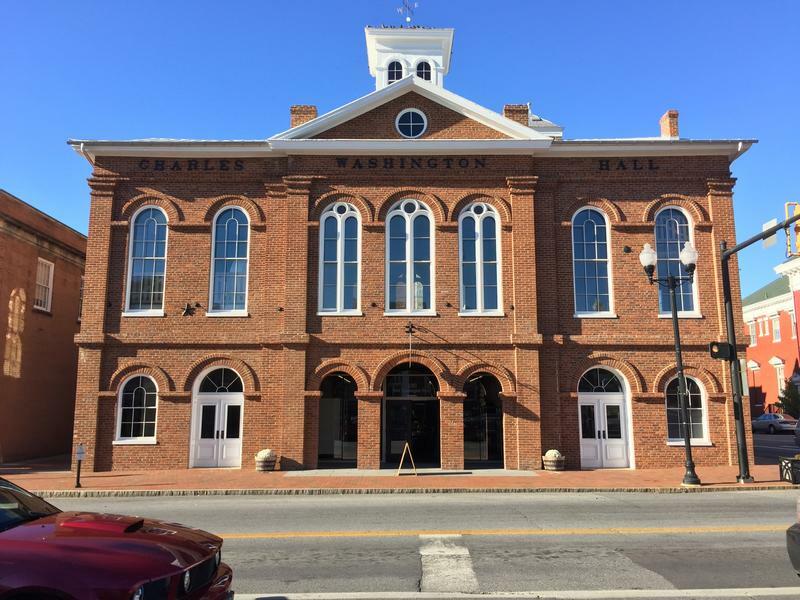 During a special session of the West Virginia Legislature in October, lawmakers passed a bill that makes redeveloping historic buildings in the state more viable, financially. The bill had widespread support from both sides of the aisle, but some are concerned it doesn’t go far enough. 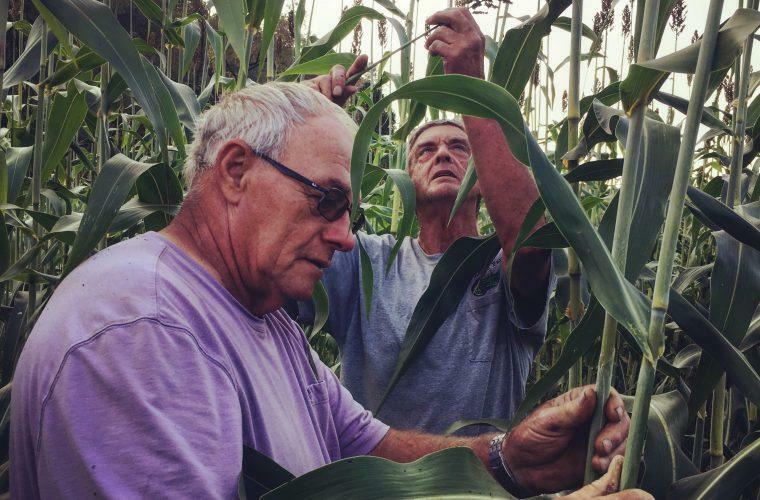 Gone from most kitchen pantries, sorghum keeps connections strong in some rural communities. Just a few miles down a narrow, winding road from Buckhannon, the seat of Upshur County, West Virginia, a carved wooden sign welcomes visitors to Tallmansville. At first glance, there’s not much to the rural village of around 400 residents, but I’ve spent enough time in these hills to know what little first glance says about a place. 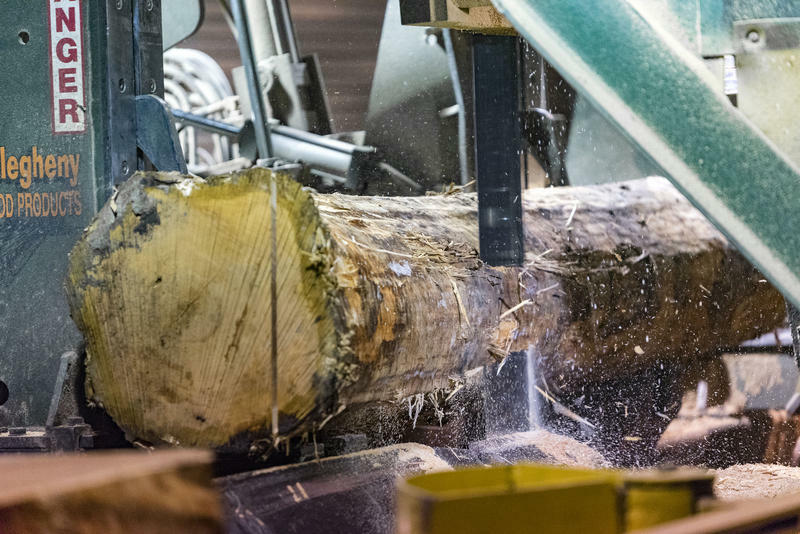 In the next part of our occasional series on the timber and forest products industry – from seedlings to final products, we follow cut logs to one of West Virginia’s most sophisticated sawmills. Independent producer Jean Snedegar spent some time at Allegheny Wood Products’ Kingwood Sawmill and Pellet Mill, with plant manager, Mark Wilson. 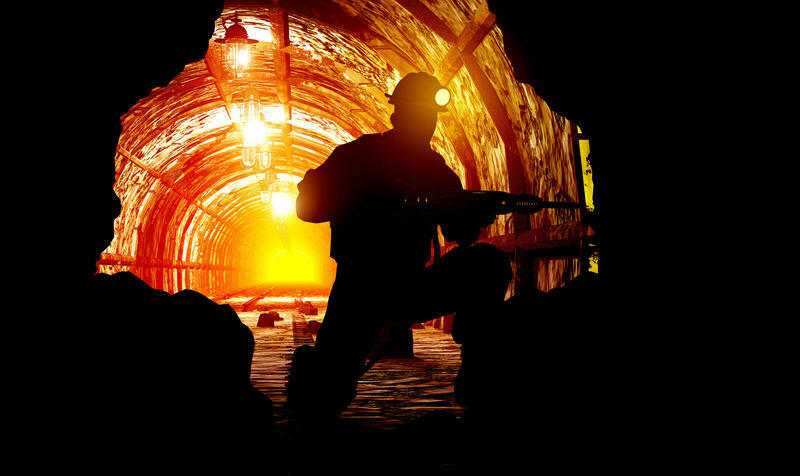 Coal Mining Jobs Are Down, Fatalities Are Up – Why? At a time when we ought to see fewer deaths from coal mining, the number of fatalities has increased compared to last year. The greed of coal tycoons and politicians (who are sometimes one and the same) is the reason.